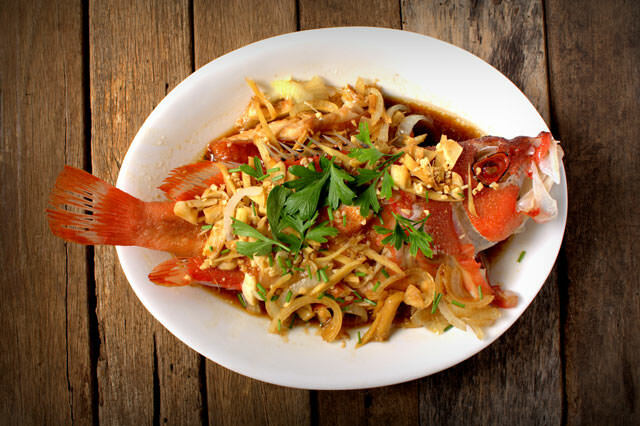 If you are really serious about eating healthy, you will want to invest in a steamer, a piece of cooking equipment that will allow you to prepare fantastic dishes like this steamed Chinese snapper. Being able to prepare food this mouth-watering and still so healthy is definitely worth the investment. Pour 1 ½ inches of water in a steamer and bring it to a bowl. Place the snapper fillets in the basket and season them with salt and pepper. Drizzle the snappers with ginger, sesame oil and soy sauce. Add shiitake mushrooms, red chilli peppers and tomatoes in the basket. Steam everything for about 15 minutes. You should be able to flake the fish with a fork. Sprinkle everything with cilantro and serve.